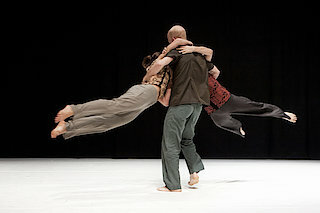 NOVEMBER is a playing field for three dancers to create an autumnal landscape. As if posing for a collection of postcards, their bodies become entangled in physical games, constructions and mechanisms. NOVEMBER tells us about the group and their collaboration, about privacy and common space, about imagination and the feeling of belonging, but also about joining forces and playing the game of being together.